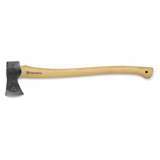 Was $39.99 You save $20.00! After mowing the lawn, trimming the hedges, or whacking those pesky weeds, you want to enjoy a cool drink. 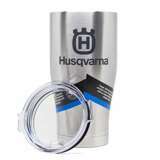 Good thing liquids stay freezing cold when you leave them in your Husqvarna Orca Chaser Stainless Steel Tumbler. A premium stainless steel tumbler at a reasonable price, this chaser keeps your cold drinks cold and your hot drinks hot as long as you like. The dual-insulated, 18/8 food grade stainless steel body has a copper-clad inner body with a vacuum-sealed chamber. That's all a fancy way to say, your drink's temperature won't change a bit. The body holds 27 fluid ounces and the narrow base fits in most standard cup holders. Husqvarna and Orca, it's a match made in tumbler heaven.